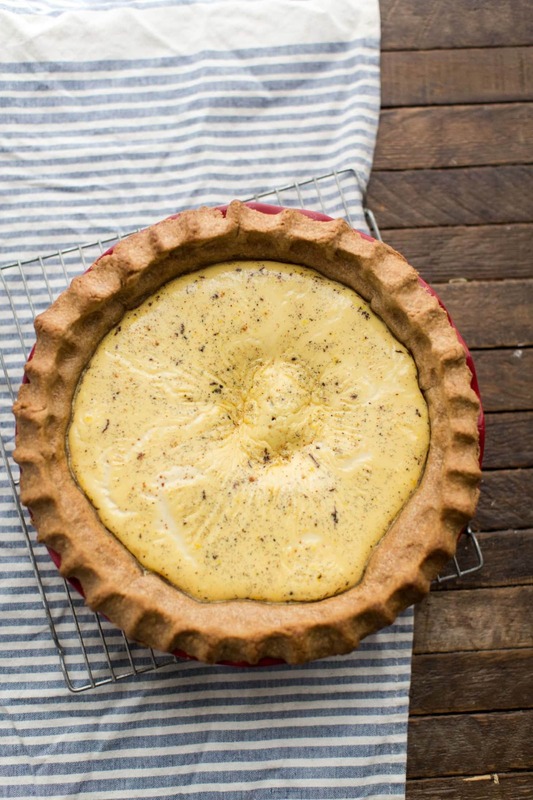 Maple Custard Pie with Spelt Crust | Naturally. My school of thought when it comes to sweets is that if I am making a treat, I shouldn’t really worry about making it ‘healthy’. 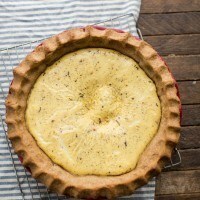 This custard pie might seem like it goes against that thought. However, the two swaps I’ve made to the original recipe are less about health and more about flavor. The maple syrup adds a bit of warmth to the filling while the crust is nearly an equal in flavor. I really enjoy baking with spelt flour as it’s a nice wheat flavor with just a hint of sweetness (and if you’re looking for spelt flour, Bob’s is the flour I typically use). In a food processor, pulse together the spelt flour and salt. Add in butter and continue to pulse until butter is in small, pea-sized pieces. Alternatively, use your hands/pastry blender to cut into flour in place of a food processor. In a bowl, combine 4 tablespoons of water and 2 teaspoons of maple syrup. Add to the flour and pulse until the dough starts to clump together, adding 1 extra tablespoon of water at a time until the dough forms large clumps while pulsing. Remove to a surface that has been lightly dusted with spelt flour, form into a disc, place in a bowl covered with a bowl, and refrigerate for 20 minutes. While dough is chilling, place rack in the middle of your oven and preheat oven to 400˚F. Add milk to a medium pot. Cut open the vanilla bean and scrape into the milk. Toss in vanilla bean and bring milk to a simmer. Remove from heat. In a large bowl, whisk together eggs, maple syrup, and salt. Temper eggs by slowly pouring milk into the egg mixture and whisking constantly. Continue to whisk mixture until all milk is incorporated. Return to the surface with spelt flour and roll the dough out slightly larger than your pie pan. Transfer crust to the pie pan and crimp as desired. Place pie weights (or parchment with a handful of dried beans) on top of the crust and par bake for 10 to 15 minutes until set and just beginning to brown. Pour filling into the par baked crust and return to oven. Bake pie until filling is set and a knife comes out clean when inserted, 25 to 30 minutes. Pie will jiggle quite a bit and set more while it cools. Let cool to room temperature or colder before serving. Sprinkle nutmeg on top before serving and store leftovers in the refrigerator. + Custard filling adapted from Betty Crocker. Goodness, what a beautiful pie! I love those flecks of vanilla bean! I’ve always wanted to work with spelt crust and ever since I had a custard cake for my birthday I really want to make it again! But this is definitely more on the healthy side than my birthday cake. I hope I don’t mess up the custard! Ohhhh I can’t wait to try this Erin! I love those vanilla flecks on the surface, so pretty!